We have some beautiful new products to help you enjoy the cooler temperatures of Fall! But that doesn't mean it has to be boring! Liven up your space with cozy accessories like blankets from Scotland, Peru, & Europe. Add some beautiful French scented candles and enjoy the change of season. Change up the menu for meals that are hearty and warm. 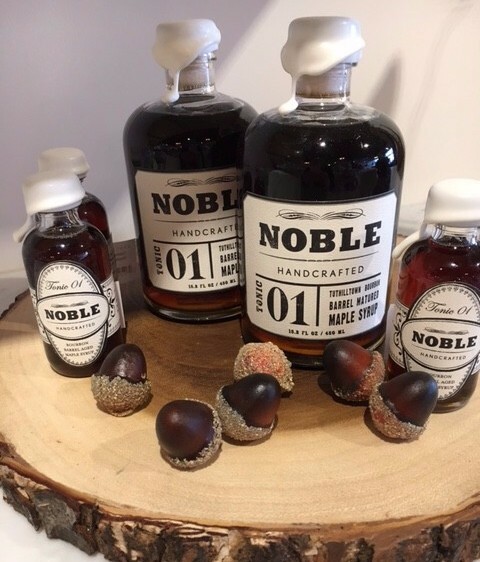 Noble Maple Syrup will add a touch of fall to your pancakes or French toast. Check out our pantry section filled with new, exciting flavours from near and far. Try something new like Meyer Lemon Relish or Salad Flowers. Organic Artisan Meyer Lemon Relish is a versatile condiment that adds a bright and intense flavor to any dish. Serve with cheese, in a salad, on roast chicken, or wake up a simple salmon. Made from 100% organic ingredients, Organic Meyer Lemon Relish contains Meyer lemons, extra virgin olive oil, shallots, champagne vinegar, salt and herbs. Salads look extra special when you add a hint of summer with Salad Flowers from France. Made with a combination of cornflower, marigold and rose petals, this will brighten any dishes and snacks you create! This pantry item is the simplest way to impress your family or your guests. Even if you aren't returning to school or your kids are grown, September seems to mark the beginning of a return to routine. Embrace it! And if you're looking for inspiration, take a break from the routine and stop by and see what's new. We are open Tuesday through Saturday but if your schedule doesn't align with our hours, ask us about Private Shopping by appointment. To show our appreciation for you - our beloved clientele - we would love to help you curate your shopping experience here at Grace & Co.! We look forward to seeing you next as well as welcoming the changing seasons with you!